The roots of the problem-oriented medical record may stem from a bygone era, but its concept still rings true today. The problem-oriented medical record (POMR) is a comprehensive approach to recording and accessing patient medical data. First developed by Lawrence Weed, MD, in the 1960s, the POMR gathers information from all members of the patient's care team in order to determine a diagnosis and create a treatment plan. The POMR typically includes the patient's history, a list of symptoms, test results, a treatment plan to deal with each issue, progress notes, and a discharge summary, including any follow-up steps that must be taken. Matt Douglass, cofounder and senior vice president of customer experience at EHR vendor Practice Fusion, offers an example of how a POMR works. "You can think of a POMR as a different view, a different type of filter by which a physician orders the patient's problems," he says. "For example, if a patient is suffering from wheezing and coughing, the physician asks questions and, through this investigation, discovers the patient has additional complications—say pet dander—that have spurred asthma. From a POMR standpoint, the patient has allergy-induced asthma, and a treatment plan would then be developed." POMRs are especially beneficial for documenting chronic illnesses, which may require multiple treatment methods that must be adjusted over time. The tool also helps cases in which patients with complex medical issues see more than one physician. Such documentation is particularly important when the treatments for multiple illnesses interact. In addition, POMRs help patients become better educated about their own health issues and how they are being handled. In today's EMR environment, the POMR is likened to the subjective/objective/assessment/plan, or SOAP note, a form of documentation that allows clinicians to include notes in the patient record. In the POMR, the SOAP note not only encompasses the patient's history, test results, and other pertinent health information but also the physician's observations, a list of issues prioritized in order of importance, and notes on why the problems are organized in a particular way. Furthermore, it's divided into three distinct components for diagnostic, therapeutic, and patient-education plans. According to Susan Schulte, a medical solutions specialist, certified trainer, and HIT compliance officer at the Center for Computer Resources, the POMR was widely used from its inception through the 1980s. "The POMR was a functional way of documentation," she says. "Through to the '80s, a doctor could follow the format similar to that of the current SOAP note and be able to articulate his findings and recommendations by being focused on a problem—not just on the symptoms and facts around the problem." However, Douglass believes that few of today's EMRs use Weed's concept of the POMR. "The term POMR has gone in and out of vogue over the years," he says. "When Dr. Weed first created the POMR, he did so to educate his medical students. At that time, it was a new way of looking at medical records; it is fairly hierarchical. Essentially, it's diagnosing as you go." Still, Douglass says components of Weed's vision have found their way into today's EMR software. "The POMR is really the foundation of the SOAP note, which is the standard flow that physicians use. In many cases, the SOAP note forms the core of current medical recordkeeping," he says. 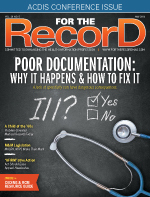 Physician documentation, especially when it comes to problem lists, in the EMR world has been largely shaped by meaningful use requirements, says Sandy Routhier, RHIA, CCS, CDIP, owner of HIMpoint. "The way [problem lists] have been incorporated into the EMR by vendors or how hospitals use them; it hasn't been going well," she notes. "In fact, when I see a problem list in an inpatient record, I tend to ignore it because the entries are inaccurate and not well-maintained." Currently, few EMRs rely solely on Weed's concept, in large part because the POMR represents a different way of thinking and requires more time spent with patients during office visits, hospital stays, and aftercare. Additionally, it requires cognitive time to think through how problems may come together into a single list and how to maintain its accuracy. "[The POMR] is not how physicians have been trained, and it would take them more time," Douglass says. "Physicians tend to look at one thing at a time. However, physicians that have been working in the field for a while can work well with the POMR. Unfortunately, moving from how physicians are currently trained to taking the comprehensive approach of the POMR requires time and training." The arrival of ICD-10 has further complicated matters, Routhier notes. "Imagine an orthopedic surgeon attempting to add a fracture diagnosis to a problem list and being presented with more than 17,000 options. He or she is just going to pick one that looks close and move on," she says. "The problem list is then being autopopulated into a physician's templated reports such as daily progress notes and discharge summaries and it's junking up the record. A good narrative description of a diagnosis by the physician is preferred and let the coding professional assign the code." Henry C. Chueh, MD, codirector of the Massachusetts General Hospital Laboratory of Computer Science, notes that when Weed created the POMR, it was easier to establish a story over time because physicians often saw the same patients on a consistent basis. While EMRs are beginning to evolve into problem-oriented systems, physicians must manage patient problems separately by using the SOAP notes in the current software. "At Mass General, we have a conceptual model, and the problem is central," Chueh says. "That problem list becomes part of the same problem list for patient office visits, too. Physicians can drill down and see all the notes related to that problem, and can move around the record easily." Schulte believes most physicians are not trained to take a hierarchical approach to addressing health issues. That, plus workflow issues and the structures of most EMRs, prevents widespread use of the POMR. A complicated reimbursement system doesn't help matters either, she notes. "In the past, whatever the problem was, the doctors just wanted to take care of it. Now, in order to get paid, the doctor has to pull other things from the EMR," Schulte says. "I don't want to take away from a really good practitioner's caregiving. As much as they want to be excellent caregivers, doctors can't do that and stay in business if they are not also focused on how they will be paid." Adds Douglass, "The POMR gives a more holistic way of looking at the issue and requires a great deal of data entry. We're not quite there yet as an industry. It requires entering family history, all allergies, medications, test results, and other information, and it requires more data than medical records are collecting at this point. As vitals and more information get plugged into EMRs, those are helping us get to that point. Physicians will begin to see that we are dealing with a holistic problem, which is a more comprehensive view." Some settings are more conducive to POMR use than others. For example, the POMR is less likely to be used in an outpatient setting in which patients are seen for only a few minutes and turnaround is fairly rapid. In hospital and home care settings, however, physicians are more focused on organizing patient issues into primary and secondary hierarchies. Therefore, the POMR is becoming more prevalent in both hospitals and home environments where clinicians can take more time evaluating and working with patients. "We are also seeing the POMR in academic settings where teaching physicians are willing to experiment and try different things," Douglass says. "When Dr. Weed created the idea, it was when he was teaching other physicians." Larger health systems also are looking into using the POMR as they seek ways to innovate and help their physicians improve care. "The thinking is more widespread than perhaps the acronym currently is," Douglass says. Chueh believes a POMR is beneficial in any setting that treats the same patient for the same disease over time. "You may have multiple doctors in any particular facility. And if a patient is being seen by more than one doctor, to have all those records woven together is very useful. So wherever there is a continuum of care, the POMR is a useful document," he notes. John Squire, president and chief operating officer of Amazing Charts, the developer of a new POMR called InLight EHR, adds, "If you have a problem that develops over time and gets worse or better, you can track that with the POMR. For instance, a patient may have back pain that comes and goes over a number of years. Physicians can track that development over time. If the pain is intermittent and then becomes visible as something, such as arthritis, then the doctor can track that long-term problem, make an accurate diagnosis, and develop an effective treatment plan." Most experts agree that documenting in a traditional POMR is a time-intensive process that requires significant interaction with patients and extensive tracking of health information. Other drawbacks also stem from time-related factors, Schulte notes. "You don't have the time to comprehensively document with all the descriptors that you need," she explains. "That prohibits doctors from using this type of system. It's not terribly efficient, and physicians have to be efficient in order to survive." For this reason, Schulte says POMRs have fallen out of favor. "Even if you went back five to seven years ago, the use was much more extensive. I don't know of any doctors who work with it, and I consult with more than 75 doctors on a regular basis," she says. While POMRs excel at organizing information within medical record documents, Routhier says the industry is not taking advantage. "Is it being used effectively and to the best potential? No. Physicians don't receive a lot of formal training related to medical record documentation methods and formats," she says. • Failure to link conditions to underlying causes for accurate combination code assignments. "Congestive heart failure, for example, may be an entry in the problem-based record with the underlying cause (ie, hypertension, valvular disease, ischemic cardiomyopathy) possibly entered as a separate problem and the conditions are not linked," she says. • Listing a body system, sign, or symptom without associating a diagnosis. "For example, a physician may list the problem as renal rather than the associated diagnosis such as chronic kidney disease or acute kidney injury," Routhier says. • Listing a differential diagnosis in a format that appears to be a definitive diagnosis: "You sometimes see a physician document UTI [urinary tract infection] without using uncertain terms such as 'possible' or 'likely,' then she or he stops treatment after negative cultures, but never says the UTI was ruled out," Routhier says. "That becomes problematic when there is uncertainty whether a condition was ruled in, ruled out, or uncertain at the time of discharge." For purposes of POMR use, the sooner a diagnosis can be made, the better, Chueh says. "To the degree that you want to have the kind of record a POMR provides, you have to make decisions early for what kind of problem you want to diagnose," he says. "Patients will come into the hospital and present with certain symptoms, but you don't always know what the diagnosis is yet. You have to find the problem early in order to create a comprehensive record in this way." However, if this hurdle can be overcome, the comprehensiveness of POMR documentation can lead to rich data analytics possibilities provided the caregiver has the time, conduit, and tools available. "Additionally," Chueh adds, "many conditions patients have are chronic. If you're able to organize your information in a problem-oriented fashion, then the POMR becomes an easier process over time because the data are organized in that way for each patient and offer a fuller picture of each patient's health care needs." While a POMR can be beneficial in some clinical settings, the type of documentation it generates may be too simplistic for billing purposes. To code correctly, Douglass says coding billers would have to interpret the specifics of the POMR. "In the 'rolled up' version of the POMR, its components are organized into a hierarchical list; therefore, the coder would need to access the more extensive list," he says. "They would have to be given an expanded view. Coding billers who are really in tune with the doctor, though, should have no problem with the POMR." Schulte notes that experienced coders should have no trouble working with a POMR. "But for newer coders, especially with ICD-10 being rolled out, they have to go through notes and make sure all the boxes are checked," she explains. "The POMR is more time-intensive, and coders can't afford to do that in this day and age. It's something that they need to read and look at carefully for problems. Even if they break it down into a SOAP note, they have to go through that and look for key points. The rigidity of the requirements means we don't have that luxury anymore." Chueh believes that the problem-oriented EMR software at Mass General helps coders and clinicians. "Our software package makes it easy for a clinician to document a patient's problem and map it to the correct ICD-10 code(s), which makes it easier for coders to validate the information," he says. "It helps them avoid taking that second step of looking up codes. When they are looking at higher levels of reimbursement, coders can identify what are new and old problems, and differentiate whether issues are chronic or acute." Chueh clarifies that coders do not rely entirely on the software, noting that the technology helps the clinician create documentation that can minimize the extra time needed to review each record to validate the information. Specifically, the software is not proposing or generating any codes itself; rather it makes it easier for a clinician to document with problems that are mapped to ICD-10 codes. The problem-oriented notes clearly organize the information needed to assess the medical-decision characteristics of the visit, he adds. Routhier cautions coders not to rely solely on technology. "There is still a need for coding professionals to interpret the medical record entries then apply coding guidelines, index and tabular instructions, AHA Coding Clinic advice, etc, while keeping in mind clinical validation and opportunities to further clarify documentation (in the form of a query if needed) prior to making the final code assignments," she says. "In the ideal world, every caregiver wants solely to care for patients and see them get well, but right now, I see it flipped," Schulte says. "A doctor has to break down everything: 'This patient has COPD, and this is how we will address it.' In the current environment, doctors have to prove a person is sick to justify care and get paid. Many more steps and things must be addressed and recorded. That said, without question, use of the POMR affects each specialty differently, and integrating the EMR with the POMR, beyond the SOAP note, will likely happen in ways that benefit each specialty. "It's just a matter of time," she continues. "Over the years, I have known doctors who have been paid by barter, but they can't afford to do that anymore. I also know doctors who maintain practices in underserved areas and don't want to retire because no practices will start up in those areas after they stop working. It would be too expensive for new physicians to fill their shoes, so there simply won't be access to medical care in those places once they leave. Experiencing those scenarios has helped me realize that there is still goodness in medicine despite all of the hurdles physicians must move past. And, as we continue expanding the features of the EMR in this digital age, we will likely find our way back to documenting cases in ways that look more like what Dr. Weed originally created."